See the 6 Best Companies & Get Quotes Fast! As an active duty member of the military, your needs are taken care of by the government including access to Affordable life insurance not just for yourself but for your family. But as you make the transition to civilian life you will have to work out a new life insurance policy. 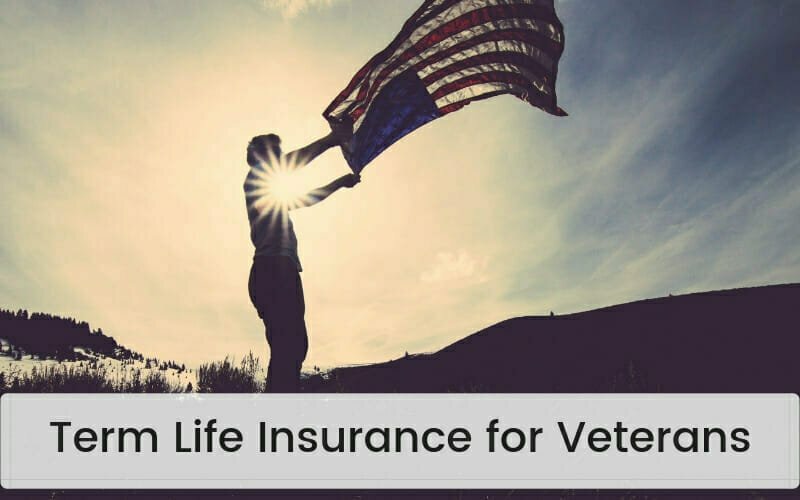 The military offers life insurance benefits for veterans the same as active duty military but as soon as you are no longer in service you might want to consider buying term life insurance for veterans. What Is Term Life Insurance for Veterans? Term life insurance for veterans can help offset the financial difficulties associated with separation as well as the otherwise expensive premiums that you would face from commercial companies. When you enlist you become automatically enrolled in the service members group life insurance, SGLI. Veterans can receive coverage from the veterans group life insurance, VGLI. In both cases the coverage is a whole life insurance protection policy up to $400,000. However, veterans are not automatically enrolled in their program as opposed to active duty members so, if you want to change from your service member option to your veteran option you must make sure you do it quickly. Veterans get life insurance for the duration of their active duty service, but the government does not provide it for life. Military members, retirees, and families are given free medical care from VA facilities, but not all benefits are available to all veterans. There is a priority system in place and those with the greatest financial need come first. What Is The Time Limit to Convert SGLI to VGLI? You will continue to receive free life insurance coverage from SGLI up to 120 days after you separate. Following that you have another 120 days to convert SGLI to VGLI, with no medical exam. In between this time, you won’t have coverage and if you do wait more than 8 months after your separation date you will have to undergo a separate medical examination for your new life insurance plan. If you wait more than one year after your service member coverage has expired, you cannot convert to the veteran’s plan.One thing you want to bear in mind is that the premiums for the veteran plan are more expensive than the service member plan. The monthly cost will increase with age. As an enlisted member your premiums top out at $29 per month even at the highest level of coverage but if you retire at 32 you could be paying $40 per month for your veteran’s coverage. It is for this reason that military members and recent retirees should consider getting term life insurance quotes from a private insurer. Provided you have maintained your health standards which, unless you are forced into early retirement because of failed PT, you will qualify for 20-year term life insurance policies with $400,000 in coverage for an average of $20 to $25 per month. 1. SGLI can be converted to VGLI without any health questions being asked so long as you apply for covered within 240 days of separation. 2. Spouses of service members who are separating from the military and were formerly covered under the FSGLI spousal group can convert to an individual permanent life insurance plan using different private insurance companies, but they must do this within 120 days of Separation to get the benefits. 3. Those under SGLI-DE who are 100% disabled and unable to work can apply for an additional 2 years of free coverage after that point they automatically qualify for VGLI so long as the premiums remain current. 4. Using VMLI Service members who are severely disabled can obtain a grant to get mortgage life insurance protection which will cover the mortgage for their family home in the event that the veteran or service member dies. 5. The VA does not actually require a 100% disability rating to qualify for S-DVI. even veterans who have a 0% disability rating can apply so long as they meet other criteria. 6. TSGLI will cover all service members with SGLI You were seriously injured. Any veteran who suffered a severe injury while in service on or after October 7th, 2001 can also be eligible for this coverage. SGLI and VGLI have the option of accelerated benefits whereby the individual can access up to half of the value of their life insurance if they are diagnosed with a terminal illness or given 9 months or less to live. Those who have retired with otherwise good health might be able to save a significant amount on their premiums especially if they get a term life insurance policy which maintains the same premium payment for the duration of the term, those who retired as a disabled Service member, VGLI could very likely be the more financially secure option. A 56-year-old leaving the military could get $400,000 worth of coverage from VGLI, paying only $268 per month.Said female could get a 20-year term life insurance policy that could cost over $300 per month for the same coverage with a private insurer. This difference in cost is contingent upon your health conditions at the time of your application. Disabled military retirees are also able to apply for a 2-year extension for SGLI at the time of Separation so that there is significant time to find more appropriate coverage. As a member of the Armed Forces you are given life insurance coverage under the servicemembers group life insurance, SGLI, set at $400,000. But, 120 days after you leave the armed services you will need a new insurance plan. That said there are plenty of companies that cater exclusively to Veterans and provide life insurance policies best fit for those who have worked so hard to protect this nation. Learn about the 6 best life insurance companies for veterans below. United Services Automobile Association (USAA) is a company devoted exclusively to serving military members and their family and provides an array of financial services including Insurance programs. You can purchase life insurance through this company so long as you are still enlisted. They do not require a separate medical examination after you If you purchase your life insurance from this company within 240 days of Separation, it will completely replace any coverage you were receiving with SGLI. Moreover, catering to military members, USAA is the only option that provide the program where in military members can convert SGLI to private USAA coverage to not only cover the military members themselves but cover their spouses and children. This is something that you cannot do with VGLI. The Department of Veterans Affairs provides this life insurance plan through Prudential Insurance and it also is designed to replace SGLI. you must enroll in this program within one year and 120 days of separation. If you enroll within 240 days of your separation you do not have to undergo a separate medical examination. The premium you pay are based exclusively upon your age. Military Benefit Association (MBA) started in 1956. Since that time, it is provided enlisted members with a wide expanse of benefits and currently offers life insurance to all current and past members and their families. Military members and spouses can purchase up to $1000000 in coverage and you will find that many of the plans have a lower premium compared to SGLI. Navy Mutual was founded in 1879 and has since provided service members and their families with life insurance policies. You must be actively enrolled or have separated within the last 120 days to apply for and receive these benefits. They have adjustable life insurance policies which are based on your gender and age exclusively. Uniformed Services Benefit Association (USBA) is a non-profit Association that provides Insurance products to active duty military members and veterans. The insurance underwriter behind this organization is New York Life Insurance Company. This company is worth mentioning because they were the first insurance provider to eliminate the war Clause from life insurance policies which previously prevented coverage if a military member died in combat. Armed Forces Benefit Association (AFBA) provides insurance plans as well as health insurance coverage and banking services for military members. They offer life insurance policies that have no terrorism or combat clauses as well. When you are looking for life insurance as a veteran it is important to start before you separate. This will help you to avoid the pressure of meeting that 120-day deadline so do you have ample time to review your different options and compare based on your current medical situation and disability level what the military options are versus private insurance options. You might find cheaper coverage in the private sector and you might prefer having a different plan than those which are available through the VA. Some military members want a whole life insurance policy which builds cash value so that they can borrow against it if necessary later. People who are younger and healthier might sign significantly lower options for a 20 or 30-year Term Policy after they leave the military through a private insurer. In any case, shop online and talk with independent life insurance agents to figure out what the offers are that you might receive. Absolutely look over the insurance providers listed above who specialize in military base policies so that you might be able to convert your coverage not just for yourself before your spouse and children. When it comes to finding the best term life insurance for veterans, it is important to compare all of your life insurance options to weigh which ones are right for you. The easiest way to do this is to work with an independent life insurance agent who can compare life insurance rates from the best companies on the market all at once. Our agents will discuss with you your personal needs for life insurance coverage, your financial situation, and your health, in order to understand what the best life insurance policy is for you. Give us a call today to begin finding the best life insurance for veterans, or use our online quoting engine to compare life insurance rates instantly!